Growing up, most of us never saw ourselves on a Saturday morning cartoon show. Maybe we pretended Pidge from Voltron was a girl, so we wouldn’t get stuck playing the Princess with our friends on the playground. And by the way, why were the girls always named Princess? Regardless, what we had were boys. Boys everywhere. Boys as the hero. Boys as the winner. Boys as the devil may care rogue with a heart of gold. I don’t have to tell you that representation matters. It matters if Bert and Ernie are gay, and it matters if we say characters are gay outright. Being able to see yourself reflected in the media has a lasting impact on you as you grow. Not seeing yourself, and not seeing positive representation has a negative impact. If all we see are serial killers, victims, and otherwise disposable characters, we start to feel that we are those things. We’re unworthy of love or caring, because all we see in the media must be what people really think. Those views are outright wrong. But their prevalence makes them damaging to adults and especially to children. Childhood is a constructed concept, and not something granted to all. Some children have to work from a young age, either inside or outside the home. When we introduce them, via cartoons and children’ programming, to a place where they can be more things, we inspire them. We give them hope and we let them see the world as it really is, even if it’s a safer version there of. It’s an obvious fact that the world looks like what it looks like, which is I don’t walk out and see a sea of white men. That’s not how the world looks to me, and that’s certainly not interesting. The biggest complaint I’ve seen about representation in children’s shows is that if often feels very ‘of the week,’ like they’re brought in to make a specific point, and then they vanish. Recently that’s changed to a new type of background queer characters. No longer are they the ‘very special episode,’ they’re now just organically part of the show. Take, for example, We Bare Bears, a cartoon about three bear brothers. Grizzly, Panda and Ice Bear are trying to awkwardly find their place in society, and often end up interacting with humans in different ways. Some of those ways are a little silly, of course, but over their seasons, they’ve had multiple background lesbians. Without any extra work, the bears included a happy pair of female newlyweds. This also happens on shows like Star vs. The Forces of Evil. The magical princess, Butterfly, comes to earth to gain maturity and while there she learns that everyone likes kissing. On the montage, we see men kissing men and women kissing women like it’s no big thing. Very related to the idea of background queers is the one where people were queer all along, but it’s a surprise to the audience. There are a lot of great examples of this. There’s Clarence, where one of his friends has a secret and it’s not his two moms (it’s his 6 toes on one foot). There’s also Doc McStuffins, where Thea and Edie learn a valuable lesson about being prepared. Now in Doc’s defence, every episode is about learning a lesson, so having one be taught to the lesbian doll parents is an amazing moment of equality. But we also have shows like Avatar: The Legend of Korra or She-Ra and the Princesses of Power where in characters are queer and it’s no big. The problem that happens with these shows is that sometimes they don’t make it obvious enough that the characters are queer. If you’d blinked at the wrong time, you wouldn’t spot the lesbians on She-Ra, just like it’s possible to miss the one on The Good Place. And speaking of all that, we also have to consider shows like Voltron: Legendary Defender, where they release information that someone is queer, and then it’s a drive-by. If you hadn’t paid attention, you would have totally missed that Shiro was gay. Sadly this was of questionable value to viewers. On the one hand, it’s great that we’re getting some non-drama about queer characters, but on the other hand, we don’t get to experience them being gay. Shiro’s a double edged bayard, however, because while it was a big reveal, it was barely a blip and could easily be ignored. Also there was a bury-your-gays to boot. The creators are aware of their missteps with Shiro, though, so there is hope. This is the solution. Put queers everywhere, in ways that are obvious and crystal clear. Because finally we have the greatest of all, the shows where everyone’s queer and it’s absolutely not an issue. That’s right, we have a cartoon L Word and it’s name is our beloved Steven Universe. Unequivocally, they had the grandest biggest gay wedding of any cartoon, and we love them for it. You can also see this on Adventure Time, where they didn’t hold back and gave the ladies a happy ending. These shows started out by giving us the obvious queers. 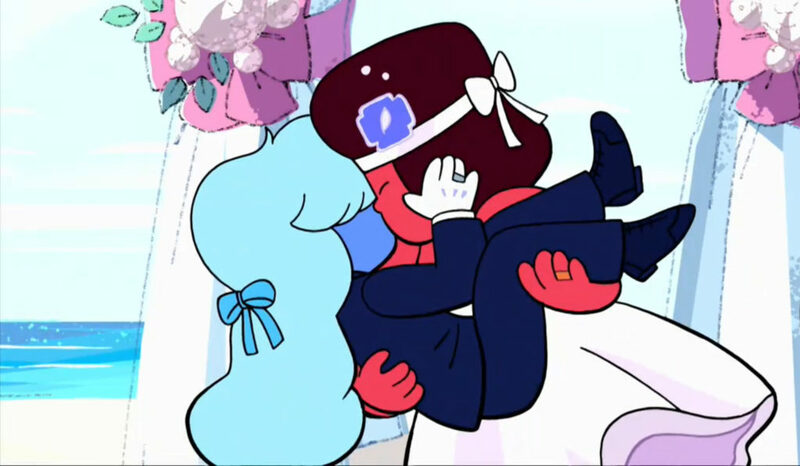 We always knew Ruby and Sapphire were a pair, but some people could have argued that their fusion of Garnet wasn’t romantic. That can’t be said anymore. And now that Princess Bubblegum and Marceline have kissed and gotten their happy ending, we can have no doubt of their love. If you can’t tell, we’ve made amazing progress. I didn’t even touch on things like The Loud House or Big Mouth or even adult cartoons like BoJack Horseman. We’ve had years and years of cartoons that were exploitative and for laughs, just like we did with traditional television. While the heydays of Saturday morning cartoons are over, animated television has made great steps forward to including everyone. With every new show, the next generation gets a chance to see themselves on TV, just like everyone else. We’re making it easier for them with every gay marriage and happy ending, and I couldn’t be happier.